KUALA LUMPUR- Starting with the grand official launch of Visit Malaysia Year (VMY) 2007 scheduled for Jan. 6 to be officiated by Prime Minister Datuk Seri Abdullah Ahmad Badawi at Taman Tasik Titiwangsa, Tourism Malaysia will launch an array of events this month in a bid to attract 20 million travellers to the country this year with an ambitious tourism promotion campaign. Topping the list is the Flora Fest 2007, which will transform selected venues in the capital city and Putrajaya with colourful displays of flora found in the country. Tourism Malaysia director-general Datuk Mirza Mohammad Taiyab told the Seoul Times several events had been lined up in conjunction with the Flora Fest, which would run from Jan 20 to Feb 4, including a Florathon on Jan 20. "The Florathon, the first event for Flora Fest 2007, is a brisk 3km walk and participants will be judged not by speed but by their floral costumes. The event will cover Jalan Raja, Jalan Parlimen, Jalan Cenderawasih, Jalan Tembusu and Jalan Cenderasari in the city," he told a group of Korean journalists who are here for a familiarization tour of tourism Malaysia..
Malaysians as well as foreign tourists aged 13 years and above are eligible to participate in the Florathon, which is divided into nine categories. Tourism Minister Datuk Seri Tengku Adnan Mansor will flag off the event at Dataran Merdeka while Federal Territories Minister Datuk Zulhasnan Rafique will present prizes to the winners. Concurrent with the Florathon, the Bunga Raya Waiter's Race, where participants balance the bunga raya (hibiscus) mocktail on a tray with one hand throughout the route dressed in floral outfits, will also be held. The Bunga Raya Waiter's Race, jointly organised by the Malaysian Food and Beverage Executives Association and Malaysian Association of Hotels (KL Chapter), will require participants to showcase their skills by walking or running as fast as they can while balancing a bottle, can, glass or tumbler filled with a drink on a tray. This event is open to all in the hospitality and food and beverage industry. A Flora Hunt, similar to a Treasure Hunt, is also on the cards, taking participants around Putrajaya, the Klang Valley and Selangor during which each team is required to answer a series of questions to find the "treasure." Apart from these events, the Shopping Complex and Hotel Lobby Floral Decoration Competition will be held from Jan 27 to Feb 4. 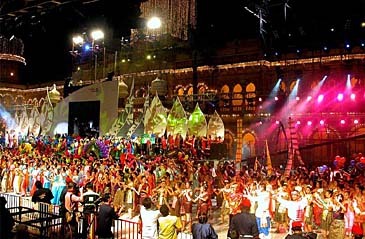 The competition will adhere as close as possible to the Flora Fest with the theme "Colours of Harmony." The highlight of Flora Fest 2007 will be the Floral Parade, to be held on Jan 27 at Persiaran Perdana in Putrajaya. It will be officiated by the Yang di-Pertuan Agong Tuanku Mizan Zainal Abidin and attended by ministers, foreign dignitaries and the public. At the parade, 18 floral-decorated floats from the state governments, local authorities and private organisations will compete in five categories for the premier trophy, theme trophy, creative trophy, parade trophy and jury award. The parade will be interspersed with marching bands and street performers. The Nineteen bands include 15 school bands. The year-long campaign aims at aggressively marketing and promoting the country as a major tourist destination. Malaysian Retailers Association (MRA) expects the retail sector growth to accelerate this year in anticipation of more tourist arrivals during Visit Malaysia Year (VMY) 2007. Assuming that tourists' spending pattern remained constant, the retail industry outlook would be "better" in 2007 as the government had projected tourist arrivals to increase to 21 million from 16 million in 2006, according to business sources here. Last year, receipts from shopping accounted for one quarter of total tourist spending. In 2007, tourism receipts are expected to contribute over RM40 billion to the economy. Thus far, the retail sector had been doing "pretty good" with 9.5% growth in the first half of 2006 compared with the previous corresponding period, they said. "The growth comes from hypermarkets and supermarkets. Their sales had increased due to aggressive promotions," market research company TNS Worldpanel general manager Michael Hawkins said adding that 2007 would be a year of consolidation for hypermarkets with Tesco taking over Makro. He expected intensified competition from the other large retailers such as Giant and Carrefour as they would open at least two to three outlets each. As far as consumers are concerned, they will get good deals (in the form of cheaper prices). On consumers' retail spending trend in 2006, a Tourism Malaysia official said the fast-moving consumer goods (FMCG) segment alone grew by 4% with hypermarket sales accounting for about 18% of the total sales of the FMCG industry.